Whoa. A monster, alright. A potentially nice space, utterly destroyed by the details. 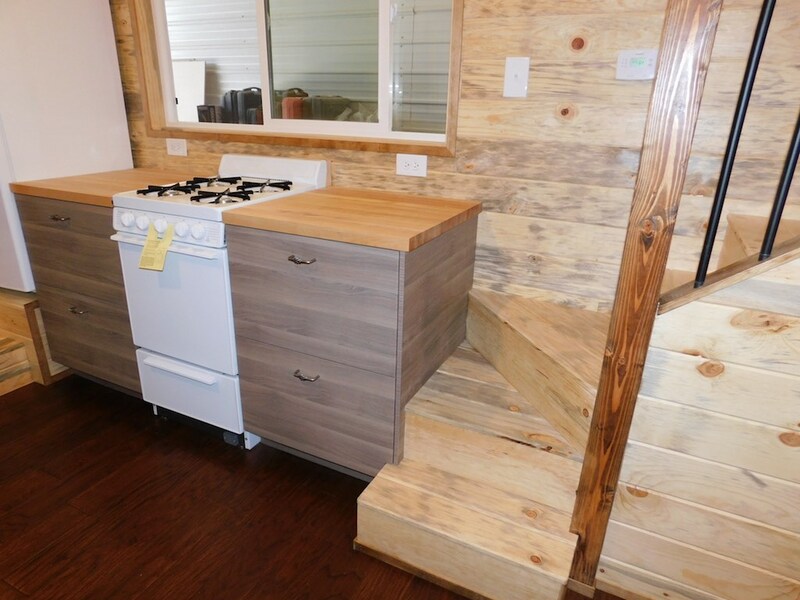 The plastic drawer fronts, the stove, the refrigerator, hollow core doors, combined with a total lack of imagination in the use of space. Someone hit the sale aisle at a big box store and “scored” on everything from the drawer pulls to the bathroom sink and peel up flooring. 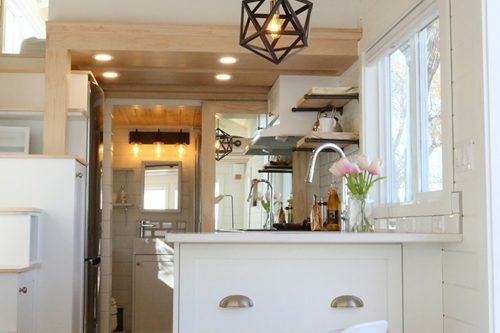 Contrasting with what looks like a lovely kitchen sink and faucet as well as a few other nice touches. A mixed message if nothing else. Not sure who would consider this a “Swoon”. LMAO…wow. A potentially nice review, utterly destroyed by a [needlessly] querulous delivery. That’s a bit harsh! This is for a traveling military family — one of the few THs built out of necessity instead of a pleasant fantasy. 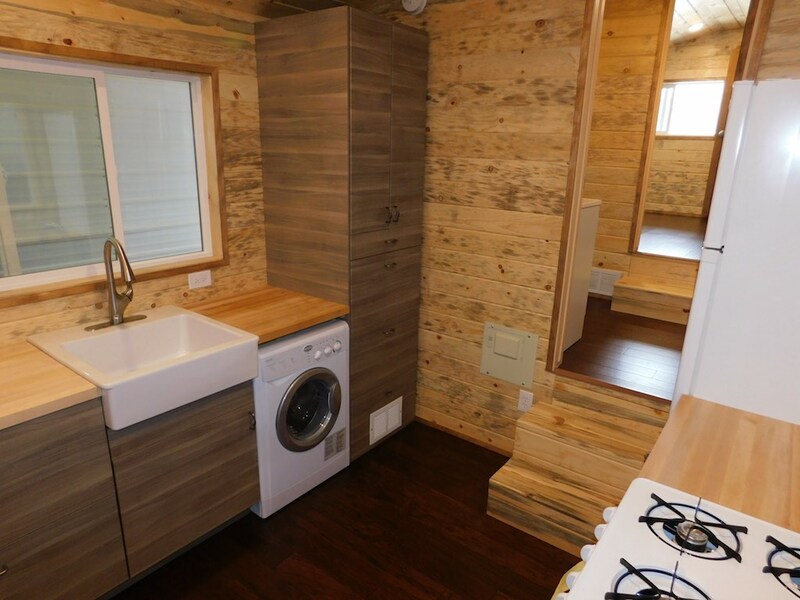 They got a freakin’full size tub, 3 closets, staircase WITH banister, and an interior that won’t fight with their own decorating ideas, which may have included picking out their own drawer pulls. They look perfectly nice to me I know what ultra-cheap looks like: I’ve lived in landlord’s specials most of my life. There’s a nice living area. I hope the cushions will make the storage couch a worthy crash pad, one of the most important things to me in a TH. I prefer pocket doors, barn doors, high-end oil-rubbed stainless-river-pebble reclaimed polished concrete granite hand-turned hammered-copper mason-jar statement pieces myself, but I don’t have a small child to house, I don’t have to pay for my imagination, and I don’t have to pull up stakes and drive my TH a thousand miles when my superiors tell me to. The torque when a TH is frequently on the road can really do a number on a creative backsplash. Sorry if I sound a little harsh myself, but it’s so easy to drive by and slam people’ s hard work. I really could see living in this TH and not having to put it on the market in a year. 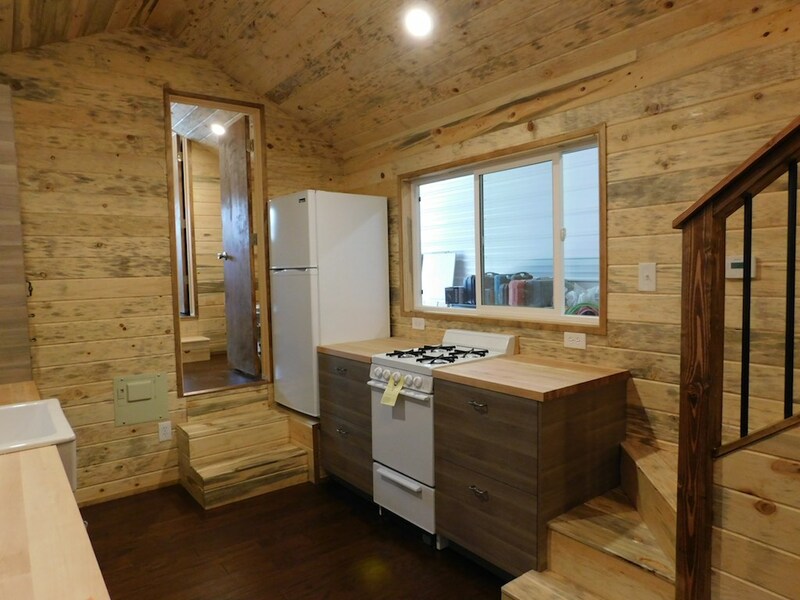 I think I like the layout, and it has a lot of space, but if they were trying to get Rustic they ended up with Shed. I know this was a great effort, but the materials don’t compliment each other, and there’s too much that looks like it’s there because it was on sale at HD. I would have loved to see this in more traditional materials that was more in tune with a family than bear hunters. Where are the stuffed and mounted animal heads? Not hating, but any TH posted here has to take its lumps if we viewers are seeing it. “Not hating, but” allow me to give a backhanded compliment, & then tear into your design decisions (w/o knowing if the choices were made by preference, cost, availability, etc, etc). & for good measure, I’ll finish off w/a jab @ hunters. Get over yourself. 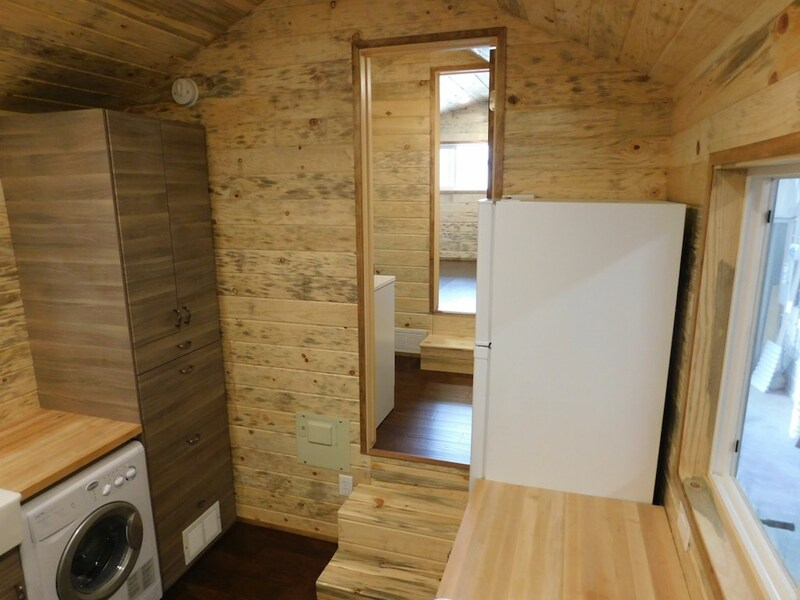 Personally Its one of the few Tiny houses I’ve seen that had everything I wanted. Wasn’t big on the beetle kill aesthetically but I would probably still end up getting it ethically. A lot of strong feelings about this house and people’s response to it. 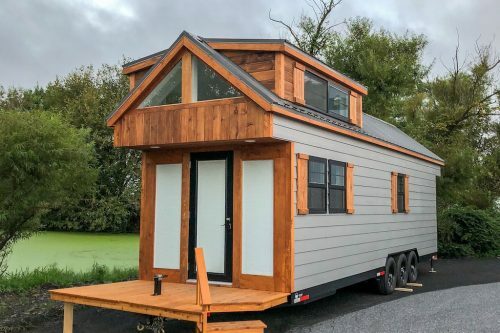 This house is listed on the “Tiny House Swoon” page. My belief, given the title, is that the ” swoon” section is where you go to find pictures of houses that have exactly what Kathy says she prefers …..”pocket doors, barn doors, high-end oil-rubbed stainless-river-pebble reclaimed polished concrete granite hand-turned hammered-copper mason-jar statement pieces ” ….or whatever special details make you “swoon”. Some of these details are way over top and some are inspirational. Many of them are out of reach of many of us financially and many of the ‘swoons” are features that are absolutely unnecessary and possibly silly in terms of having a beautiful, comfortable, functional home. I’ve always thought that was part of the point. Inspiration, beauty, dreaming….I’m unlikely to live in a pristine and perfect tiny house overlooking a stunning beach on a remote yet accessible island ~ but I still want to see how it’s done. So, when I look at this house in the context of it being in the swoon section, I don’t see a space that meets that criteria. Especially when compared to so many other spaces described that way. This is what I see, or rather don’t see…swoon. This is MY opinion. It is a matter of both semantics and taste. It’s not a judgment about or a belief that its creators didn’t work hard. I’m sure they did. They also posted their hard work on a website with a comments section. I imagine so people can share their impressions both good and bad and comment on them. We’ve all taken them up on that option! 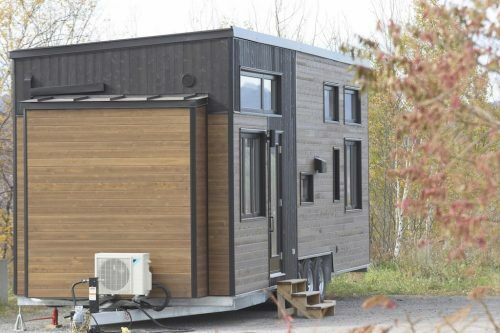 As far as it being dedicated for use by a military family….that’s a fantastic idea, beginning a movement to design and manufacture “Tiny Houses” with tiny price tags, as well, specifically for families who are pretty much guaranteed a need to relocate…and serve our country. A country where we still have the privilege of free speech, our own judgments as well as our disagreements about what makes us swoon. 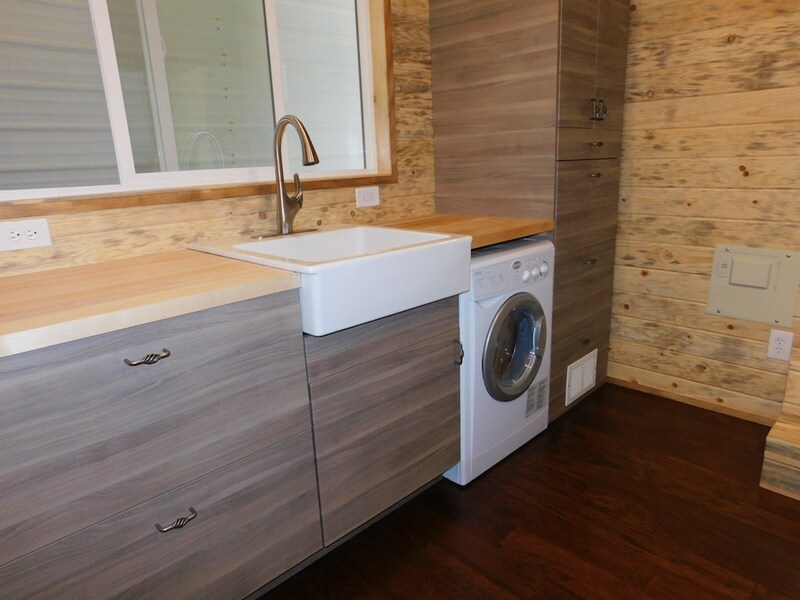 Wow…a great space that just doesn’t flow! Who puts a refrigerator right next to/on top of a 2nd step? The colors of the cabinets totally clash with the floor. I like that there are “natural” workspaces built in between what appears to be closets. I like that there are stairs instead of ladders. I’m trying to figure out if the “living room” is a downstairs area or an upstairs loft. Don’t see a place to eat. Is there a small dishwasher? (I’m a bit lazy!!) Love the fact that there are lots of windows. Not my favorite but different strokes for different folks! I think Anna got it right at the start. 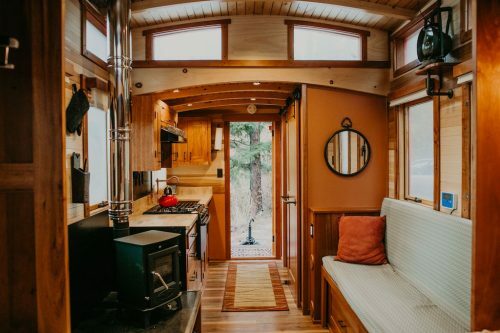 This isn’t a Tiny Home, it’s a home-build travel trailer, replete with the attendant level of taste and detailing. For what it is, it works. But compared to the rolling works of art and craftsmanship we all love and appreciate, it doesn’t begin to rate. Sometimes the Editors let things through that might have been better forwarded to Single-wide Digest. The inner aesthetic isn’t my thing at all either (by a wide margin), but there ARE great ideas here. Where else do you see double closets and a desk, all in a bedroom?! That huge living area will be fantastically useful. A full-size tub makes for comfortable showers for big military men. (My dad was Army and built like a tank, so I just assume, you know.) 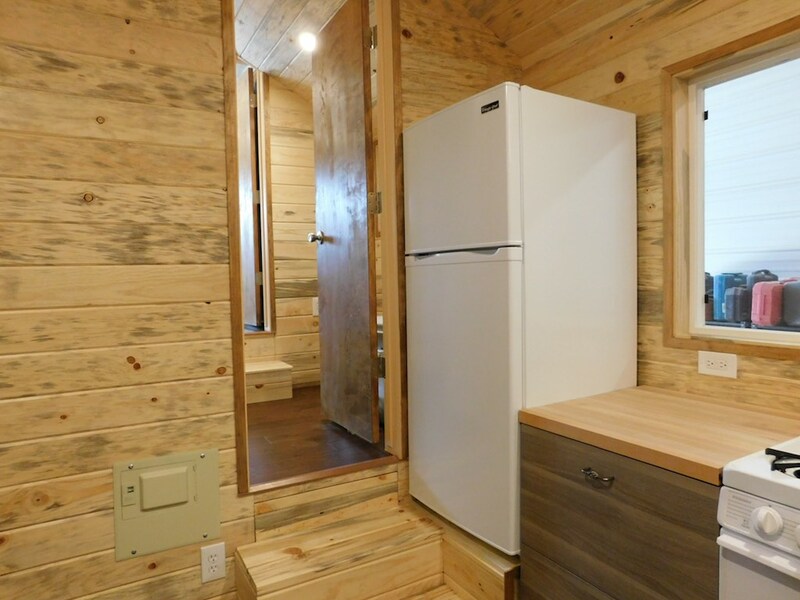 The fridge placement… I am just hoping that was a wiring and plumbing consideration thing gone desperate. I like the shade of purple on the exterior! Like a dusky grape. I have an accent wall in my home painted a lighter shade of that color, it looks great and gets a ton of positive comments from newbies to my place. Superb stair railing – my daughter is special-needs and disabled and she would either kill herself on unprotected steps or stick her head through for sure on wider-spaced posts. 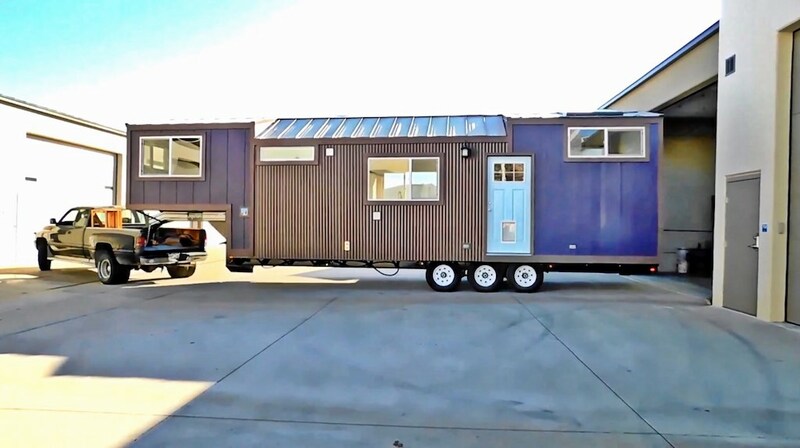 I watched the video – the place is 10′ wide, and the extra width shows, but if they move once per year, hopefully the military picks up whatever road fees there are in lieu of a regular housing/moving allowance (or however that works nowadays). I hope the family is happy here. It seems thay have the really important stuff covered.